Posted by Morgan in oilsands, tcktcktck. Big news today: Prime Minister Harper visited the White House to get a photo-op with Obama. But he didn’t expect that photo-op would be organized for him, by the DC Action Factory. The scary, climate destroying monster met with Obama today to discsuss how they could stop the Afganistan war, how to revive the global economy, and what to do about this pesky energy problem. Unfortunately, he wasn’t smart enough to propose a fair, ambitious and binding global treaty that would create a green global economy with lots of good, clean jobs. No, instead, the oaf that he is, thought he could impress Obama with a milkshake. 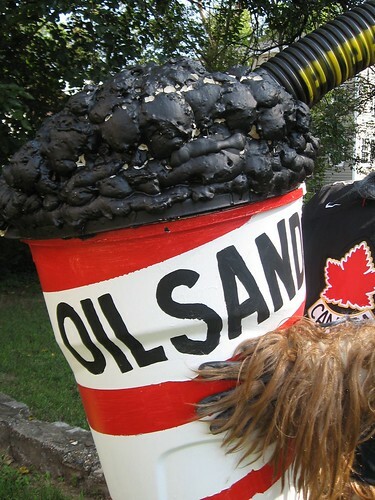 An oil sands milkshake, to be exact. Doesn’t Harper know that oil sands are the largest climate project in the western hemisphere? 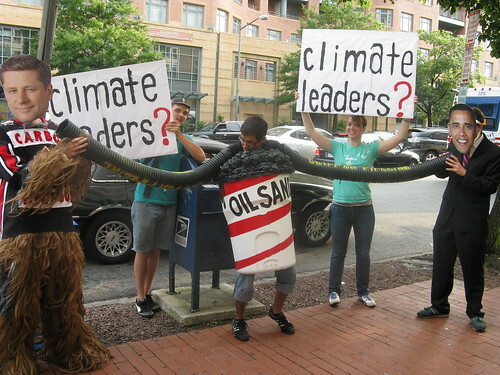 Don’t they know that tar sands are a huge road-block on the road to a Copenhagen Climate Treaty? And don’t they know that oil sands extraction is killing polar bears? With all the press in the last couple days, you think he’d have gotten the message. RAN dropped a 70′ banner off Niagra Falls yesterday. Greenpeace activists in Canada are still locking down to a gigantic shovel and dumptruck, effectively shutting down Shell Oil’s climate crime. Popularity – Harper is desperate to gain in the polls in Canada where he has been unable to get a majority of Canadians on his side. His backroom boys are no doubt advising him to saddle up to President Obama as a means of appearing more moderate. Wake up Canada! This isn’t the kind of leadership the world needs. As we enter the final 3 months before Copenhagen, the G20 looms large. Activists are stepping up the pace of actions even more. Get ready for Sept 21st and the global wake up call, followed by the 350.org day of action on October 24th. We discussed energy security and climate change. I remind all our American friends that Canada is by far the largest supplier of energy to the United States. And we are determined to be a continental partner in dealing with the joint — with the very linked problems of climate change and energy security. 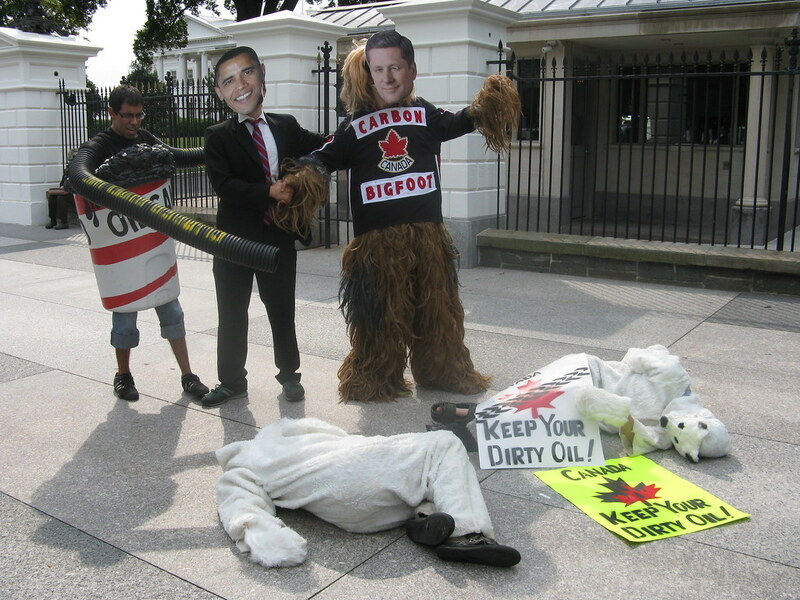 Washington DC — During their meeting this Wednesday, President Obama, and ‘Carbon Bigfoot’ Harper will sip from a larger-than-life dirty oil sands milkshake. Harper appears as a hairy and foolish Bigfoot character with no qualms about his enormous carbon footprint. While sipping their fossil fuel shake, Harper and President Obama will discuss their commitments to solving climate change ahead of the G20 Summit in Pittsburgh later this month. 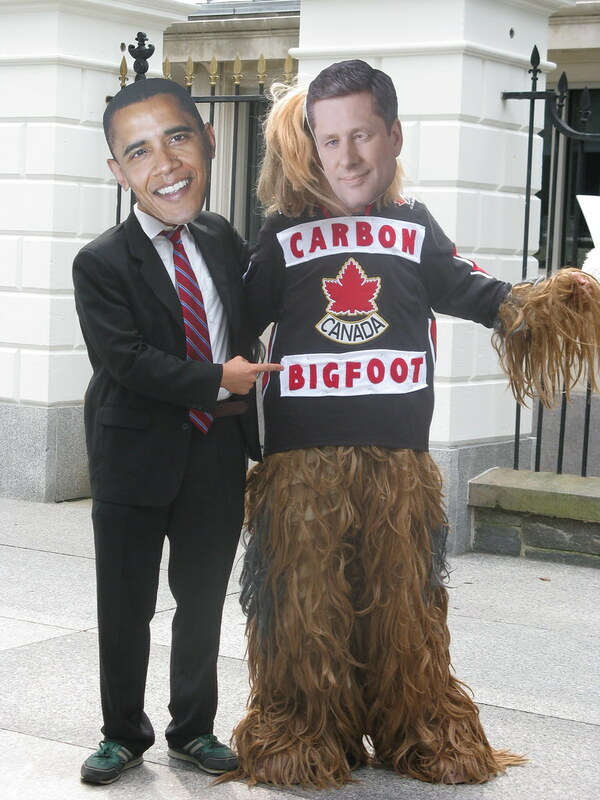 The Action Factory plans to pose as Carbon Bigfoot Harper and President Obama and call for a fair, ambitious, and binding global climate treaty in Copenhagen this December. “So far, none of the developed countries have shown the ambition and leadership necessary to secure a sufficient treaty,” says Julie Erickson, a fellow with Avaaz.org. “Canada in particular has a track record of hindering the climate process more than helping,” she adds. We’re hopeful that some tangible progress on climate finance will come out of the UNGA and G20 meetings next week. Prime Minister Harper’s disastrous climate policies make Canada one of the countries most impeding progress on the global climate treaty that countries are supposed to agree on this December. Carbon Bigfoot Harper is a strong supporter of dirty oil sands, which contribute more to global warming pollution than most other fossil fuels, and cause major local environmental destruction on indigenous lands in the Boreal forests of Canada where they are extracted. Avaaz.org is an international advocacy organization of 3.5 million members worldwide, including 240,000 Canadians.